D4 Urban to redevelop Denver Design District & Alameda Marketplace? What about Gates/Cherokee? The Denver Post has an article talking about some new development plans popping up on Baker's southern end. "D4 Urban LLC" is a partnership formed by Chris Waggett, Warren Cohen, and Jim Frank in February of this year. The general development plan for this area was approved in May of 2009. As this image shows, the northern extremes are slated to stay roughly as they currently are: big box stores we all love to hate and hate to love. 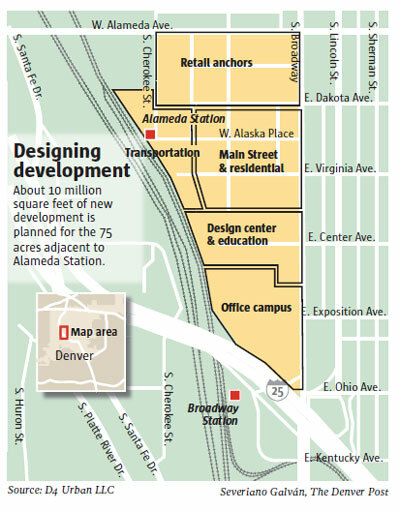 The area around the Alameda station will be "transportation" which might mean moving some of the industrial uses elsewhere and increasing that transit-oriented uses. A large swatch of parking lot space in front of the current Sam's Club area and extending over to Broadway is labeled "Main street & residential" which means a lot of things, but basically retail and residential. Centered around Center Ave. would be an updated design center and education area. And we end at the South with an office area which is a totally logical use of such a high-traffic area. Functionally it's a very similar vision to the one laid out for the Gates/Cherokee project which has been dead-ish for a few years. Back in 2009 we wrote about how the Cherokee development partners was abandoning its claim to some land in the very southern tip of Baker south of I-25 that includes the Gates Rubber Factory. They abandoned it as not commercially viable. Presumably if there is a duplicate project built a few blocks north there will initially be less demand for the Gates plot to be rebuilt since it will take a while for the D4 Urban property to fill with tenants. This could be another vision that fails to come in to timely fruition much like the Gates redevelopment was born and has now seemingly died. Submitted by garbanzito on Sun, 04/24/2011 - 21:24.
the key phrase in the Denver Post article is "Over the next few decades ..."